Roasted, baked, blended into soups, added to salads, baked into fries, or paired with protein - sweet potatoes add flavor and nutrition to any meal. These healthy spuds have just 103 calories in a medium potato and are filled with vitamins, minerals, and antioxidants. So whether you start your day with Sweet Potato and Spinach Egg Muffins, make a Southwestern Sweet Potato and Kale Quinoa Salad for lunch, or make Sheet Pan Salmon, Sweet Potatoes, and Asparagus for dinner, don't shy away from sweet potatoes. 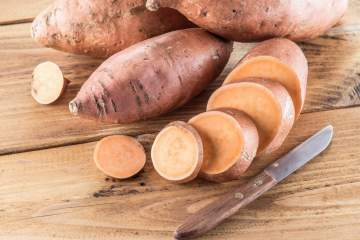 Sweet potatoes are versatile, delicious, and packed with health benefits. Learn all about these nutrient packed spuds and find recipes for side dishes, soups, salads, entrees, and more.